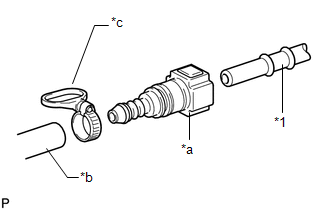 If the resistance is not as specified, replace the fuel injector assembly. (b) Inspect the injection volume. This test involves high-pressure fuel and electricity. Take all precautions regarding safe handling of both the fuel and the electricity. Perform this test in a safe area, and avoid any sparks or flames. Do not smoke. (c) Disengage the 2 claws and remove the No. 2 fuel pipe clamp. (d) Remove the No. 1 fuel pipe clamp. (e) Disconnect the fuel tube sub-assembly (engine compartment right side) (See page ). (f) Connect SST to the fuel pipe (vehicle side). (g) Install the O-ring to the fuel injector. (h) Install SST and a tube to the fuel injector. (i) Pass SST (tie band) through the loop on the handle of SST (clamp) to secure SST (clamp) to SST (adapter). As SST (tie band) does not completely prevent SST (clamp) from becoming loose, do not subject the parts to any impacts while using them. Before using SST (tie band), make sure that there is no deterioration, damage or cracks. If there are any abnormalities, replace SST. When removing SST (tie band), disengage the lock. 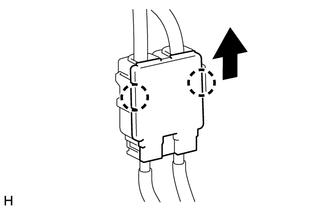 (j) Check that SST (clamp) and SST (adapter) cannot be easily separated. 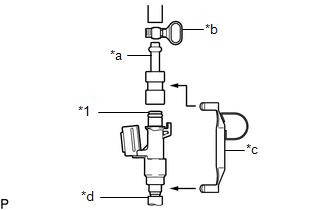 (k) Install a vinyl tube to the fuel injector assembly. Install a suitable vinyl tube onto the fuel injector assembly to contain the gasoline spray. (l) Set the fuel injector assembly in a graduated cylinder. 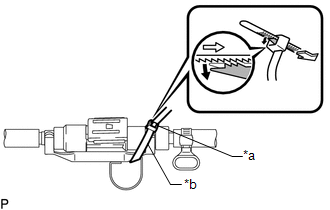 (m) Operate the fuel pump (See page ). 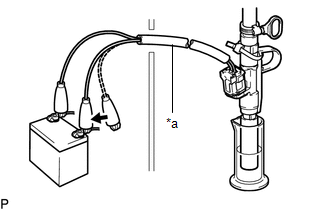 (n) Connect SST (EFI inspection wire I) to the fuel injector assembly and battery for 15 seconds, and measure the injection volume with the graduated cylinder. Test each fuel injector assembly 2 or 3 times. Make sure that SST (EFI inspection wire I) is securely connected. 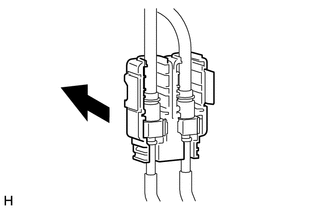 Always turn the voltage on and off on the battery side, not the fuel injector assembly side. If the injection volume is not as specified, replace the fuel injector assembly. (1) Disconnect the tester probes of SST (EFI inspection wire I) from the battery and check for fuel leaks from the fuel injector assembly. If there is excessive leakage, replace the fuel injector assembly.